Veteran developer Dave Astels is leading a Structure and Interpretation of Computer Programs (SICP) study group for the next ten months. 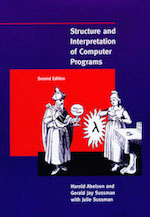 The Massachusetts Institute of Technology uses SICP as the text for one of its early computer science courses. Session one of Dave’s group starts today at 6pm. For any developer who wants to ramp up in skill, the SICP study group is an excellent opportunity to do so. MIT makes the entire text of SICP available online for free. Or you can buy a paper version of the book at Amazon. Thank you Brad’s Deals and Ken Walters for hosting the SICP group. Examples and exercises in SICP are written in Scheme, a dialect of the LISP programming language. As of this writing, installing mit-scheme via Homebrew did not work for me. Update: Some members of the SICP study group had success installing mit-scheme with Homebrew, while others (like me) did not. We did not determine why some of the Homebrew installations were successful. However, the non-Homebrew method described in this article seems to work across-the-board. Alternative solution: Grab a pre-compiled binary from the MIT/GNU Scheme site. The mit-scheme-9.2-x86-64.dmg disk image was the right one for my early 2013 MacBook Pro. Your system may be different. 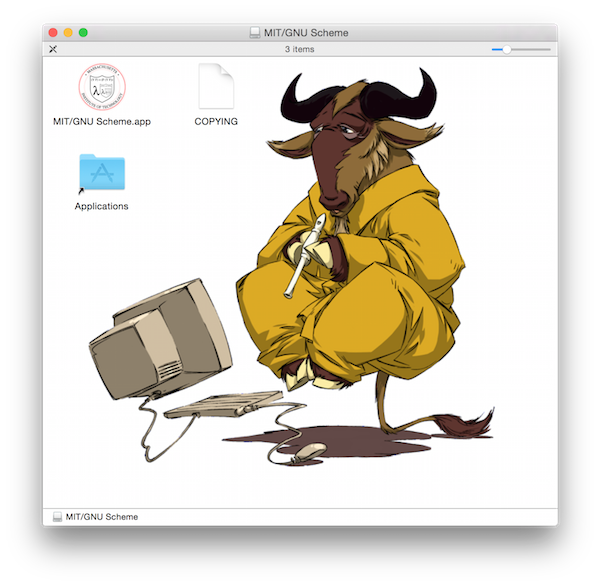 To install, drag the MIT/GNU Scheme.app icon into the Applications folder on the Mac. Scheme is run from the command line. In order to make that work, we need to setup two symbolic links. Confirm that the links are in place by checking the scheme version number. If you are like me, you will laugh at the gladiator message at the end of the version info. Why not create a single symbolic link directly from the Resources directory to the scheme command in /usr/bin? I am not certain, but I suspect it has something to do with expectations within the Scheme interpreter. The interpreter may be expecting certain files to be in certain directories. I’ll update this article when I learn more. Exit the REPL by typing CTRL-D. Looking forward to SICP tonight! Thanks Jackson Isaac for the information about symlinks as used with this version of scheme.